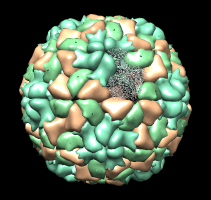 Computer Graphics Lab develops software to display and analyze 3-dimensional models of molecular machines such as viruses. 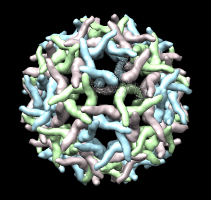 Look at some technology used to study the architecture of viruses. 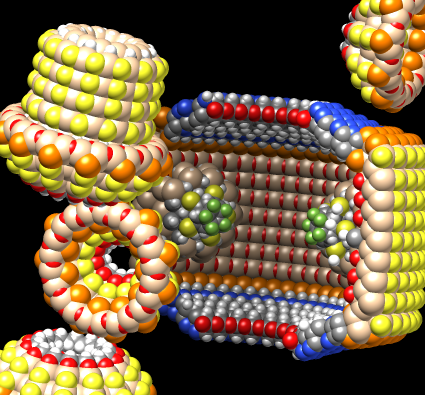 Molecular machinery is unlike human designed objects (bicycles, cameras, ...) making it hard to figure out how it operates (assembles, performs chemical reactions, is disrupted by drugs or genetic mutations). 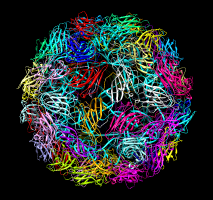 The foreign-ness of the machinery of life is not just because it operates on the molecular scale. Look at a human engineered molecular machine. Human designed differential gear, disassembled. 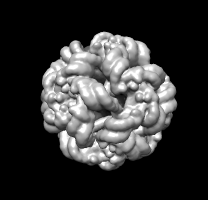 Partial robot design for placing individual atoms. Show differential gear in Chimera. Spheres. Colored by element. Non-biological: pink silicon, green fluorine. Rotation of two axles is coupled -- rotate in opposite directions. Car has differential to allow rear wheels to rotate at different rates. Use LCD glasses. Show view down axis. Zoom in. gear away. Note "teeth" on axle and cone gears, and conical pivot. Gear design comes from the Institute for Molecular Manufacturing. Useful to have natural object motion in combination with 3-d vision. 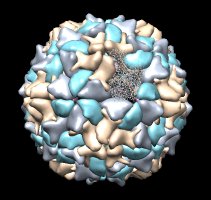 to trillions of individual viruses combining data to see atomic resolution. 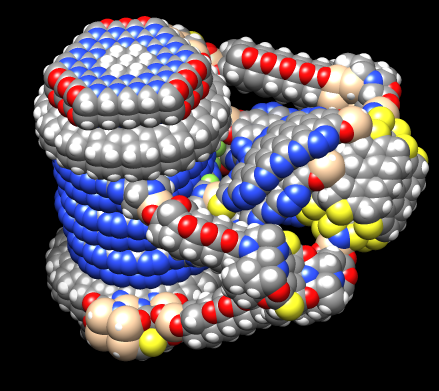 Each colored surface represents a protein. Different proteins have different colors. 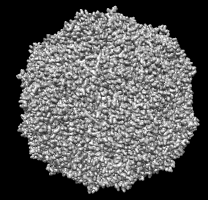 Examples shown have 1, 3, or 4 different proteins. 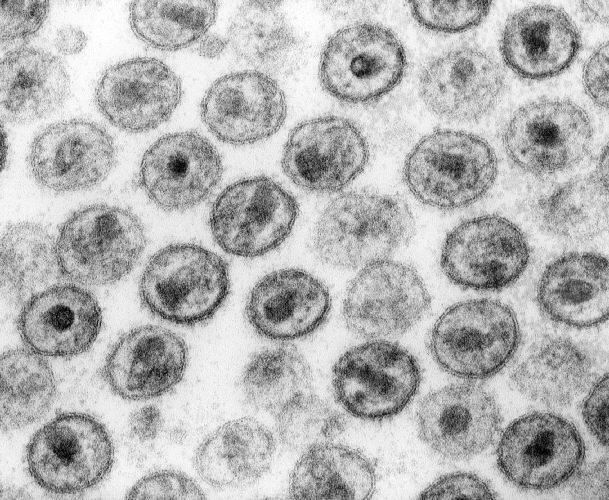 Different viruses are not shown to scale. Scale images. 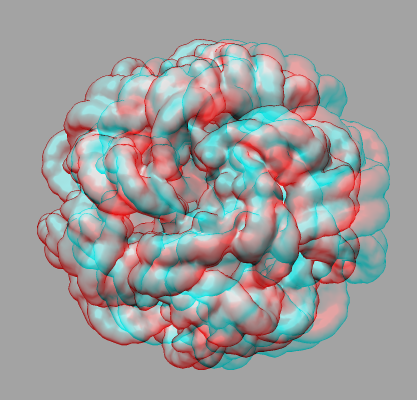 Above models are hollow because imaging data for the RNA is a blur. the rest can be guessed. architecturally a big mass of precisely folded string. 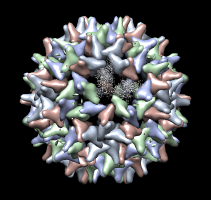 each point in the virus. The boundaries of the molecules are very hard to distinguish. 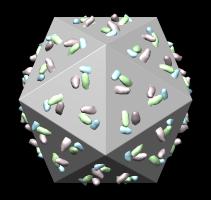 Virus density map. 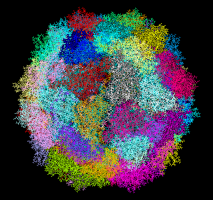 RNA density. 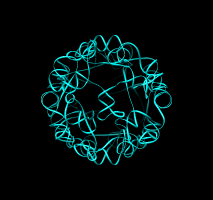 RNA density and ribbon. out RNA path in the density. 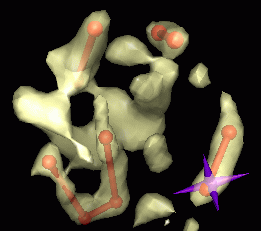 Use 8A density map containing just RNA. Device provides a 3-d cursor and forces hold it in the highest density. Pressing stylus button drops marker. "z" allows zooming by twisting stylus, "c" adjust contour level using twist. flat panel monitor, require high-end graphics card. Red-cyan glasses are a cheap alternative with no special requirements. Gray background reduces eye strain for me. colors are used. Only gray-scale coloring works well. red/cyan glasses. Share tape. 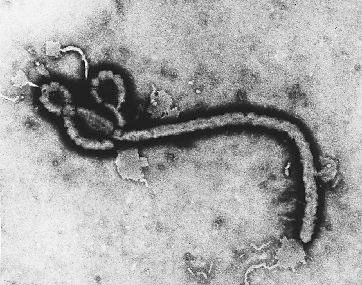 Name of virus is on virus, tape and protein. 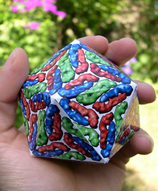 Can easily make a virus model from paper with proteins printed on the surface. Gives good feel for the icosahedral shape. 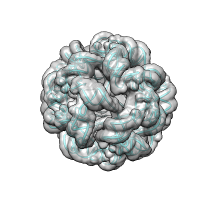 paper ribbon for the RNA place in the paper shell. A (adenine) = red, C (cytosine) = yellow , G (guanine) = green, U (uracil) = blue. projection room (5 x 5 x 10 m) at printed scale. 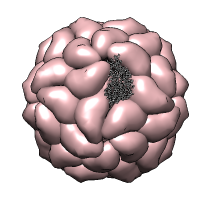 Black beetle virus has two RNA strands. Images for cutting, folding, taping are online. Demonstrate folding along all triangle edges. Leave one triangle untaped for inserting RNA (random, spooled, ...). Chimera is free, download from web, Windows, Mac, Linux. 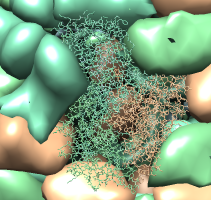 (VIPERdb) web site and also from the Protein Data Bank (PDB). 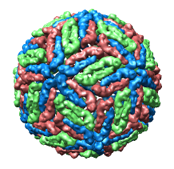 Density maps are available from VIPERdb and the EM Databank (EMDB). 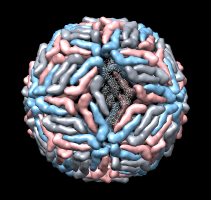 Images for paper virus models are on our web site.